Zephyr Ventilation began designing and selling hoods in 1997 with a focus on the need for quality, cutting edge, professional grade hoods for the home. Today, Zephyr has a reputation for selling well-constructed, high-quality ventilation equipment and is one of the top brands in the field. Their hoods have the look, the technology and the features that customers are looking for like quiet operation, easy cleaning, good lighting and powerful venting. Be sure to consider a Zephyr hood when you are shopping for a new ventilation solution for your home. They are a great brand and they will do the job well. Let's take a look at two Zephyr hood under cabinet models. Many consumers focus on ranges and/or cook tops and wall ovens when they think about cooking in the kitchen, but the true chef knows that ventilation is an equally important consideration. This is particularly true if you do a lot of cooking and have an open floor plan home or do a lot of entertaining in or near the kitchen. In looking at your next hood, you may want to consider XO Ventilation. 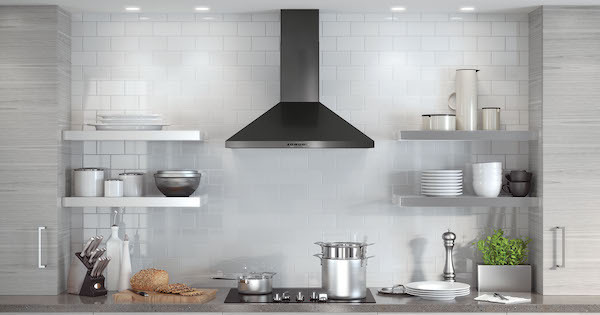 Many appliance companies offer ventilation products, but XO Ventilation is a true specialty manufacturer offering a full suite of products including under-cabinet hoods, wall mount chimney styles, custom hood inserts, island mounts, glide-outs and professional models. Let's take a closer look at the brand and a few of their best sellers across the product line. XO prides itself on its Italian heritage, which is evident in their designs.